When I was in Rome my first summer, our morning ritual involved a steaming cup of café latte and a roll that was shaped like a rose on top but was virtually hollow in the middle leaving you with all crust and a perfect vessel for butter, jam or Nutella. We called them nun buns because somehow the story was that this bread was made in the convent but they are aptly named rosette (little roses) or michetta, depending on the region. When they were fresh they were incredible, crunchy on the outside, chewy and airy on the inside. But they would come in huge paper sacks that would be put in a corner of the kitchen and the nun bun order only came every few days. About 3 hours after these rolls are baked, staleness begins to settle in. By day two your jaw might well seize up trying to chew it. On day three we would opt for a different breakfast and wait for the new rosetta delivery to arrive. My next Italian experience was studying in Florence where I quickly learned a valuable lesson. Tuscan bread is horrible. The bread Tuscany is missing one key ingredient - salt. Tuscany was part of the Papal States in the 1300s - 1500’s. The papacy had put a tax on salt thinking that there would be no way around the people buying salt because they would need it for bread, the staff of life. Well, Tuscans said che se ne frega (who gives a damn), we will just not put salt in our bread. So they didn’t. And 500 years later they still don’t. One has to admire their convictions but to be honest, it makes for pretty horrible bread. Thankfully from this tasteless stale bread was born wonderful recipes including crostini, bruschetta and bread soups such as ribollita and pappa al pomodoro. Each region has its own unique bread that is indicative of that region - go to Rome and you won’t find Tuscan bread but you will find some of the most divine chewy bread that makes your jaws hurt to eat it. Up north in the Emilia Romagna you will find a flat bread called piadina and in Sicily you will find bread with sesame seeds (from the East) and also pane arabo or Arab bread which speaks to the cultural influence that the Arab world had on this island off the toe of Italy. 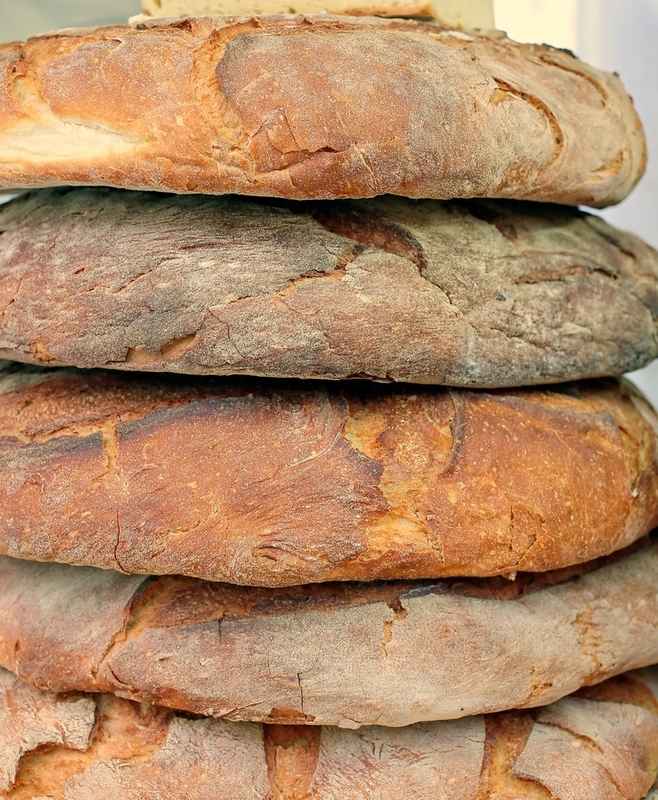 Here are few unique, regional breads to look for when you are in Italy. Focaccia – this pizza like bread is originally from the region of Liguiria in the northwest corner of the country. As if this dough drizzled with the freshest of olive oil isn’t enough, the city of Recco is known for its focaccia al formaggio, focaccia that is filled with stracchino cheese (local of course) and is so celebrated that they also have an annual festival dedicated to it. Pane carasau - This is the “bread” of Sardinia. It is also known as carte di musica – music sheets because that is exactly what it looks like. These thin cracker like sheets have a very long shelf life and were originally given to the Sardinian shepherds to take up into the hills. They would warm them over an open flame until they were pliable and then stuff them with meats and cheeses before rolling them up. Hey, Bobby Valentine, I guess you didn’t invent the wrap. 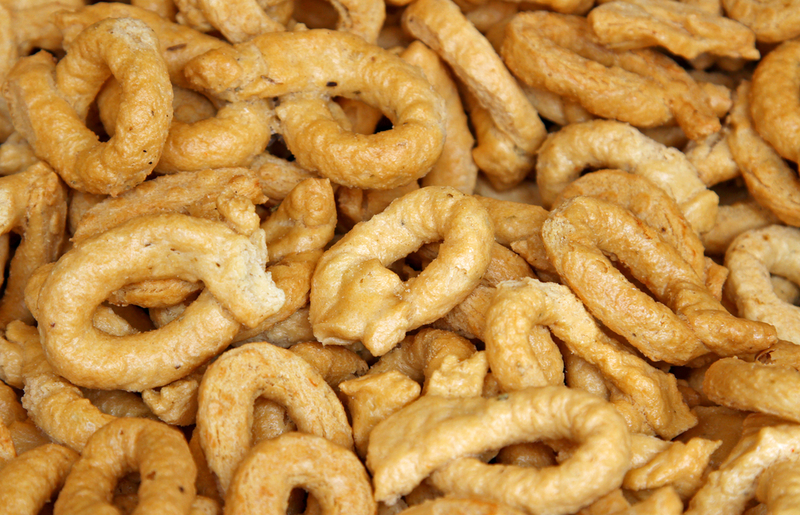 Taralli – I featured these little nibbles from Puglia last year. I think of them more as a snack, something to be eaten before dinner with a glass of wine. But of course, they have all the ingredients of bread and can be found in every bread basket that comes to the table at restaurants in Puglia. Snack or mealtime accompaniment, these are delicious. Pane Pugliese - Another offering from the region of Puglia but I do think this is the best bread you can find in all of Italy. It is cooked in a coal or wood fired oven and the two day process of making it begins with a biga or starter. The quality of the flour is of utmost importance and it truly is a labor of love. If you make at home. But maybe you should just head to Puglia. Where pane pugliese is meant to be eaten. It really is incredible how three or four simple ingredients can be transformed into so many delicious varieties. I know that these days carbs have been vilified and taking one bite of them seems to be akin to dietary suicide but I will say it again. I like bread. And with the choices that there are in Italy, you would like it too.